Lindsay Cooper, like contemporaries Fred Frith, Tim Hodgkinson, and John Greaves, cut their avant-garde teeth in the uncompromising leftist band Henry Cow. Cooper had been playing with the progressive rock band Comus when she was invited to join Henry Cow. The rest really is history, but not a well-known one. After Henry Cow’s demise, Cooper started a band called News from Babel. Both the Henry Cow and News from Babel material are fairly well-documented, but there is so much more to Cooper’s musical legacy that remains largely unknown to any but the most diehard fans. 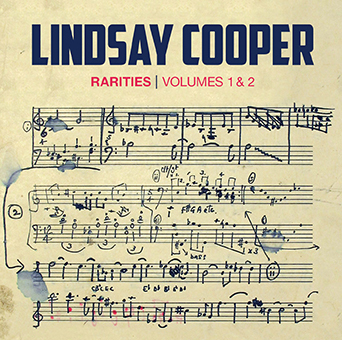 Rarities, Volumes I & II attempts to redress the various oversights in Cooper’s eclectic career as composer and improviser on some of the toughest instruments to bring to any kind of combo – jazz, rock, or improvisatory – mainly the oboe, bassoon and sopranino saxophone. Cooper suffered for many years from Multiple Sclerosis and had to retire from playing before her time. After succumbing to the disease in September, 2013, plans were made to hold a concert in her honor, with various combinations of musicians performing Cooper’s compositions. Thankfully, there’s a recorded legacy to go with that concert. This 2 disc set is full of treasures. Not all of the tracks are previously unreleased, but the ones that aren’t are extremely rare. Throughout the span of this set we get to hear songs that were originally released on limited edition cassettes or as bonus LPs that came with a subscription. The set starts out with a suite of 26 short songs written for films and television shows. Other highlights feature a “piano roulette” that was previously unreleased. Also seeing the light of day for the first time is a performance by the band Trio Trabant, formed by Alfred Harth, who invited Cooper and Phil Minton to join. Trio Trabant have only ever released one CD; the music here is from a live performance made available for the first time. This is an essential album that fills in the cracks between the Lindsay Cooper that most people are aware of, and at the same time is not esoteric enough to be a “collector’s only” item; although labeled as “rarities,” it is an excellent introduction to the varied career of the sadly missed Cooper. Guitarist, composer and loops magician Anthony Pirog is a quiet but ubiquitous force on stages around his hometown. With fearsome chops and a keen ear for odd beauty, Pirog has helped expand the possibilities of jazz, rock and experimentalism. Jonathan Badger is a guitarist, composer and video artist whose work ranges from postrock sludge to neobaroque chamber music. In live performance his compositions and improvisations show themselves in electronic garb, all the while maintaining the character of solo guitar, including the use of a distinctly musicalized video projection system. Multi-instrumentalist Luke Stewart creates transcendent sounds, Music for the Third Ear. Battle Trance’s Travis Laplante leads a tenor saxophone Quartet alongside Matthew Nelson, Jeremy Viner, and Patrick Breiner. The music is an exploration of Spritual connectivity, sure to expand one’s perceptions of the possibilities in Music. Praxis Cat is the moniker of Christine Paluch, performing with modular synthesizers and guitar. She improvises deconstructed atmospheres and loops interlaced with both beauty and anxiety. The Lost Civilizations experimental music project is a collaboration between Mike Sebastian (Tenor Sax, Saxello and Baritone Sax) and T. A. Zook (BassCello). Special guests are often featured to accentuate the ambient textures associated with the group. New York City – based composer, performer, and curator Dan Joseph has been active in a variety of musical contexts. Dan performs regularly with his chamber ensemble, The Dan Joseph Ensemble. CHESTER HAWKINS has recorded and performed a wide range of experimental music since 1985. The best-known project was BLUE SAUSAGE INFANT, which began as an exercise in modern audio Dadaism (via musique concrete and tape-collage) and later expanded to embrace drone, krautrock, electronic psychedelia, brutal noise, and cinematic sound design. Noiseless Ensemble draws on a wide range of influences to create improvisational experiences that are truly new. Though the quartet has been performing together for a year in the DC area, the musicians are veterans in the East Coast avant garde and jazz scenes. Their improvised performances include a mix of spontaneous composition, games of chance, and graphic and textual notation – as well as ample audience participation. For over forty years, the Ethnic Heritage Ensemble has carried the banner for creativity, with an emphasis on the spiritual over the technical, deeply soulful sounds with cultural roots. Kahil El’ Zabar established the group, stemming from the school and musical environment that the AACM had established in the 60’s and 70’s. Many musicians have played in the Ensemble, from Pharoah Sanders to Kalaparusha Maurice McIntyre to “Light” Henry Huff. For the past decade the group has consisted of fellow Chicagoan musicians Ernest Dawkins (New Horizons Ensemble) and Corey Wilkes (Art Ensemble of Chicago). New King Crimson Live At The Orpheum CD/DVD Audio! Wadada Leo Smith & Eco D’Alberi! Butch Morris W/ David Murray/Evan Parker/Hamid Drake/Joe Bowie and many more! Ted Daniel/Oliver Lake/Daniel Carter/Tatsuya Nakamura/Richard Pierce! ÊLoren Connors! Daniel Levin & Juan Pablo Carletti! Damo Suzuki & Mugstar! Aine O’Dwyer’s Organ Music! 2 New Cuneiforms: Andi Schnellmann/Manuell Troller/David Meier & The Kandinsky Effect [Warren Walker/Gael Petrina/Caleb Dolister]! Bobby Kapp! Paul Van Kemenade’s Three Horns And A Bass! Harvey Mandel! Fatal Tangent! Diamono Lemzo! Samba Toure! 6pm: MOPPA ELLIOTT & JON IRABAGON – Two Solos & A Duo! 6pm: DANIEL LEVIN / FRANZ LORIOT / FLIN VAN HEMMEM! 7pm: PASCAL NIGGENKEMPER / CHRISTIAN LILLINGER TRIO! Avant-Garde Guitarist, Composer, Ethnomusicologist and Antarctic Diver/Underwater Photographer Henry Kaiser Celebrates Four Album Releases with Residency at The Stone in NYC: Feb 3-8 2015. Henry Kaiser will play a residency gig at The Stone in NYC February 3 – 8, 2015. It is very rare for Kaiser to play in NYC. This Stone run celebrates his 4 new albums, released over one week on two labels: The Celestial Squid with Ray Russell, released on Cuneiform Records; and three releases on other labels, including Garden of Memory on which he is a featured guitarist, Relations with Damon Smith, and Leaps with Scott Amendola. The run at The Stone includes collaboration with such NYC luminaries as Samuel R. Delany, Bill Laswell, John Zorn, Lukas Ligeti, and Brandon Ross. Guitar summits don’t ascend higher than when legendary British free-jazz pioneer and longtime session ace Ray Russell meets the brilliant California avant-improv overachiever and Antarctic diver Henry Kaiser in the realm of The Celestial Squid. An album as cosmically evocative as its title, The Celestial Squid marks both a promising new partnership and a return to the outer-limits sensibility that informed Russell’s earliest work. With sixteen albums as a leader and more than countless session performances to his credit, including the early James Bond film scores, Russell is returning to his bone-rattling, noise-rocking roots for the first time ever since 1971. You’ll be shaken and stirred as Kaiser, Russell, and eight super friends deliver a no-holds-barred, free-range sonic cage match. They evoke improvised music’s past, present, and future while proving that free jazz can still be good, clean, liberating fun. A 5-CD box set of live guitar solos. Playing in the the trance music mode these solos could be considered to be a tribute to both Terry Riley’s late 70’s keyboard improvisations and the super human solo soprano sax of Evan Parker. Henry Kaiser and Damon Smith have been playing guitar and bass together for 20 years now. This release of acoustic double bass and 7-string acoustic guitar free improvisations celebrates their musical partnership. Featuring Scott Amendola on drums & percussion and Henry Kaiser on guitar(s). Bay area drummer, Scott Amendola is a longtime member of the Nels Cline Singers as well as working with Larry Ochs, Charlie Hunter & Ben Goldberg plus having several discs out as a leader. West Coast guitar great, Henry Kaiser, keeps busy by playing in a wide variety of contexts: solos, duos, trios and bands of different sizes. Mr. Kaiser has recorded a number duos, most often with fellow guitarists like: Derek Bailey, Eugene Chadbourne and Fred Frith, but rarely in a duo with a drummer. Each piece here is very different and shows many sides to these two gifted improvisers. The title piece is first and it is an epic length workout which goes throughout a number of different sections, moods or scenes. From rip-roaring intensity to those Dead-like space jams. It all fits together like fascinating cryptic mosaic or puzzle which unfolds as it evolves. This disc is around 75 minutes long and takes us on a fabulous journey throughout.